We enjoy blending different fruits in our jams to create unusual flavors and extend the repertoire of taste. Strawberry Kiwi, Blueberry Apple, and Raspberry Rhubarb combine beautifully on the tongue. Chutney, a spiced fruit and vegetable relish, can add excitement to savories. Try our Peach Chutney next time you serve poultry, or serve our Carrot Orange Chutney with fish. Gingered Pears are wonderful with roast pork or curry. The jams and chutneys that are listed here are the same ones we use to create the unique sandwiches and entrees we serve in our restaurant. 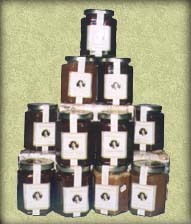 Here's a list of our homemade Jams, Chutneys and Sauces.